In my previous blog post I described my first encounter with the Spark Core. Today I want to demonstrate a first simple code example. For this I connected the Spark Core to a Weather Shield from Sparkfun. The shield offers sensors for light, humidity, temperature and pressure. It can even be extended with rain and wind sensors as well as GPS. The shield comes with a nice set of libraries and examples that I used as a starting point. To keep things really simple, I combine the entire Weather Shield source with the sensor library functions and the setup() and loop() into a single file. This did not take long and compiled quickly. I also removed the wind and rain related functionality as I did not plan to use those. The source code below takes measurements every second and writes the them to the USB serial port. This library allows an Arduino to read from the MPL3115A2 low-cost high-precision pressure sensor. on the bus (they are built-in). 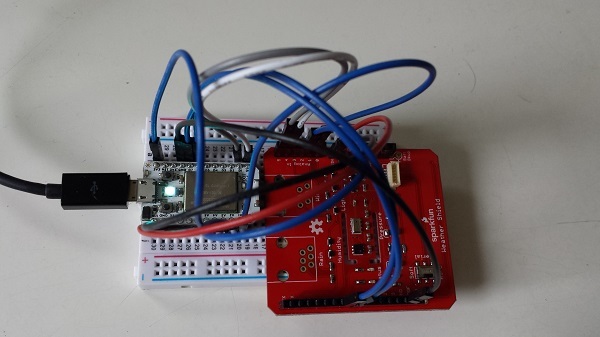 .begin() Gets sensor on the I2C bus. .setModeBarometer() Puts the sensor into Pascal measurement mode. .setModeAltimeter() Puts the sensor into altimetery mode. .setModeStandy() Puts the sensor into Standby mode. Required when changing CTRL1 register. .setOversampleRate(byte) Sets the # of samples from 1 to 128. See datasheet. .enableEventFlags() Sets the fundamental event flags. Required during setup. bool begin(); // Gets sensor on the I2C bus. void setModeBarometer(); // Puts the sensor into Pascal measurement mode. void setModeAltimeter(); // Puts the sensor into altimetery mode. void setModeStandby(); // Puts the sensor into Standby mode. Required when changing CTRL1 register. void setModeActive(); // Start taking measurements! void setOversampleRate(byte); // Sets the # of samples from 1 to 128. See datasheet. void enableEventFlags(); // Sets the fundamental event flags. Required during setup. Wire.endTransmission(false); // Send data to I2C dev with option for a repeated start. THIS IS NECESSARY and not supported before Arduino V1.0.1! // there are 16 values in 4-bits). pressure_whole >>= 6; //Pressure is an 18 bit number with 2 bits of decimal. Get rid of decimal portion. //Negative temperature fix by D.D.G. //Give me temperature in fahrenheit! //test against them. This is recommended in datasheet during setup. // These are the two I2C functions in this sketch. This library allows an Arduino to read from the HTU21D low-cost high-precision humidity sensor. breakout board you *do not* need 4.7k pull-up resistors on the bus (they are built-in). HTU21D.SetResolution(byte: 0b.76543210) sets the resolution of the readings. HTU21D.read_user_register() returns the user register. Used to set resolution. //Hang out while measurement is taken. 50mS max, page 4 of datasheet. for (int i = 0 ; i < 16 ; i++) //Operate on only 16 positions of max 24. The remaining 8 are our remainder and should be zero when we're done. a wireless transmitter (such as Electric Imp). This example code assumes the GPS module is not used. For debugging I used the Serial Communication link over USB. Windows users have to install a COM driver. However, MAC and Linux support the Spark Core USB functionality out of the box. 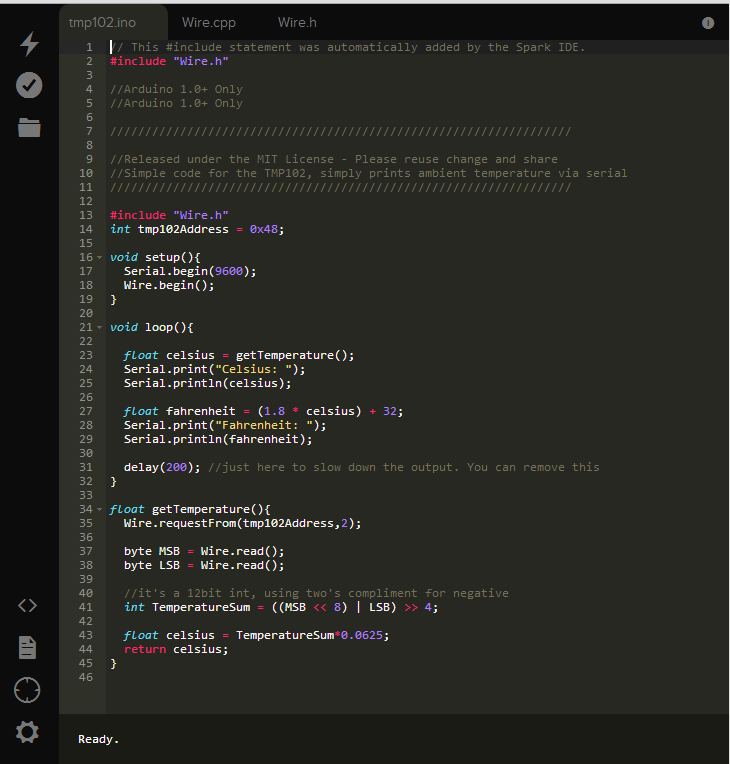 I was really pleased to see how well the Spark Core supports Arduino libraries and well written legacy code. With only a few code modifications I had the sensors up and running. The setup is now streaming values over a USB cable to a PC. There I captured the values with Tera Term and created a Weather Graph from the comma separated values (CVS). The example below shows the pressure curve of a Bay Area Storm passing by at end of February 2014. This setup is a somewhat trivial example that a basic Arduino can also do. The project really does not take advantage of the Spak Core’s connectivity to the internet. So stay tuned for my next blog post where I will add internet connectivity to the setup.